We forced the Test to get done before this year's Interbike show where all the 2019 products gets shown. A little note here, the 2018 Blackout = the 2019 Blackout so the hurry was not needed. Out of the box it was quickly noticed how light the bike is. 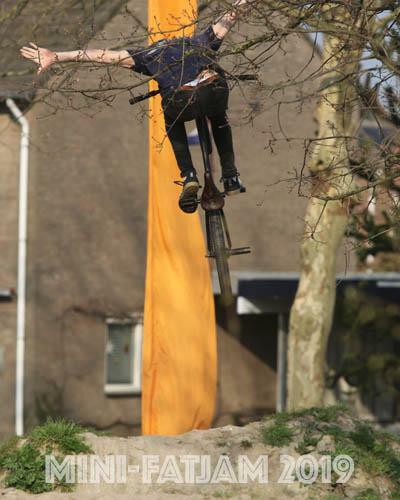 At 8,3 kilograms it is seriously lighter than the average BMX Freestyle bike we throw in the van. For those old enough to remember the John Play Special F1 cars from back in the day, this Haro Blackout reminded us of that; Fast and Beautiful at the same time. Up front the CLiQ Addict 8" bars and CNC alloy top load stem together with the Promax Click clamp on grips and Promax "P-1" V-brake and "V-Point" brake lever make up the cockpit. The bars are pretty flat which takes some getting used to if you're currently use bars with a little more back sweep. We're a big fan of lock-on grips simply because they stay in place whatever the weather and it's a breeze replacing them. The Kenda Konversion 20 x 1.95" front and 1.65" rear skin-wall tires felt a bit skinny but everyone has their preferences. We never got a flat and the Alienation Deviant front and Runaway rear double-wall rims held up too. After hitting up several BMX Dirt spots it was time to hit up the Papendal Pump track. Philip turned into the photoshoot rider and in no-time we had the shots needed to go with the Blackout XL Test. Philip praised the lightness of the bike and the looks. The stiffness in the turns made him faster than usual but the long(er) rear end took some getting used to coming from the HARO Plaza he normally rides. The Box Echelon plastic seat/carbon seat post combo added some trickness to the already flashy looking bike which of course comes with all sealed bearings (headset/BB/Hubs) as you'd expect from a top of the line bicycle. Ready to race? It sure is, straight out of the box, but make sure you've got some pedals to screw into the CLiQ Weaponz 2-piece CNC alloy 175mm cranks. The gloss black/gold combo will turn some heads of former JPS fans. Packed with an arsenal of aftermarket level components, the Blackout is in a class of it's own. The heart and soul of this model is the Blackout PTC (Power Transfer Center) frame which is the same as the aftermarket version and features a tapered head tube and 3D dropouts compatible with 3/8", 15mm and 20mm axles. On the front end you'll find the CLiQ Ci tizen carbon fork combined with Addict 8" bars and CNC alloy top load stem for nimble and precise steering characteristics. At the forefront of the drive train are the CLiQ Weaponz 2 piece cranks mounted to the sealed bearing CLiQ BB86 press fit bottom bracket which promote maximum power output. Round this package out with sealed bearing alloy wheels putting the power to the ground and you've got an elite platform ready to rail the track.